The stones in this pretty necklace will knock you out with their sparkle. 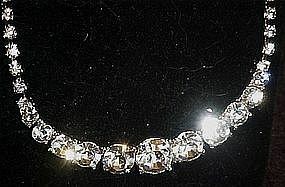 Beautiful faceted clear austrian crystal rhinestones are dazzling to look at. Measures 16 1/2" including hook clasp. Pristine condition. Sparkle for the holidays... this will look great with anything! !